"We're nothing special. But when God gives you a child like Khai Yue, it is gift. 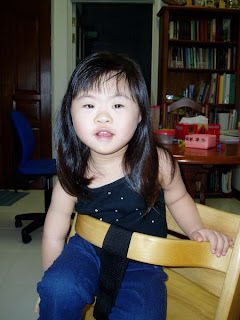 For children like Khai Yue, we as parents must be 10 steps ahead of her. And even though she is different, she has a right to know God too". Guess who's at the computer playing games? Aunty Chi Ying and Uncle Woon Hun have certainly done an amazing job helping Khai Yue to socialise! And Khai Yue, Happy 3rd Birthday! Great sharing and great family Daphne. I am a firsttimer here and glad to stumble on your blog. What a special child Khai yue is! What a special littel girl Khai Yue is! 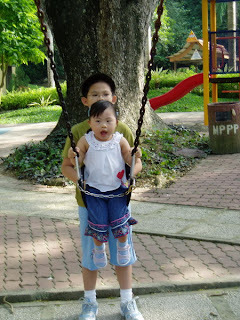 And Uncle Woon Hun and Aunty Cih Ying are wonderful and so is cute Khai Xi. A real blessed family. Thanks for sharing dear. Yes a special child is born to a special family. These families are special coz: they have abundance courage, abundance patient to cope with special children.These parents sacrifice their lives. They have to cut down on their social life. They have to start making new friends with strangers having special child too. parents willing to do anything at any cost to make the best and provide the best for their special children. No normal parents can do that. These parents are really special. I must say during these six months I've known you.I've learned more about God's very special children and I'll always be thankful to you for that.I've always wanted to do something,bring a change.Esp in the lives of children in need.But I never believed it was possible.Now,watching another fellow youth doing all this,it's telling me all u need is the heart and the will to make a difference.Even if it is a small one to us it will make huge difference in the lives of these very special children.Kudos to u dear! and God bless you always..
And God bless Khai Yue and her wonderful family.It truly is hard to find such devoted family members esp when it comes to special children nowadays.So my respect and admiration stretch out to the whole family.They definitely are special.All of them. Happy Birthday to the lil princess and I wish her many many more happy times with her family for a long time to come. 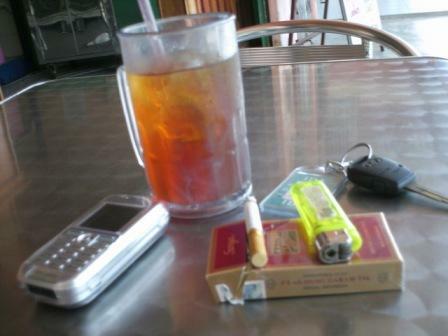 PS:I miss you btw, see u real soon alrite :D hugs! seriously guys, who could have not charmed by this sweet little girl? what made khai yue even more special is her cuteness. she's just adorable. since pinching is a form of physical abuse, i'll just give her a hug. a tight one. 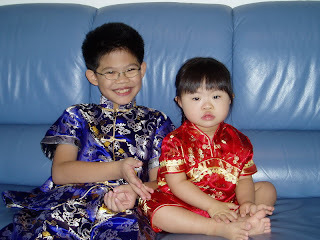 Daphne, ure a special child too, one with an "EXTRAORDINARY BIG HEART"! :) Thanks for sharing this lovely family story. Happy Birthday to the special child! You touched my heart again Daphne. No matter what...love always prevails, eh? Thanks for sharing this special story. Happy Birthday Khai Yue. She's such a sweety. I do believe that Khai Yue has an extra special gift that is waiting to be unleashed. Special children have their individual unique talents. With the love, support and encouragement she gets from her family, I am confident she is on her way. After all, if they really are special, why did they abandon him? Then I realised that when God gives you a challenge, He is giving you a test; a test which you can fail or pass. Awww...I miss you too, so come back quick! We still have our ice-cream and our lunch and dinner and...Oh dear, we do eat too much huh? Thanks for the kind words dear. We always think the silent majority can't do anything, but I guess if every silent majority did something, we can achieve quite a lot, huh? God, you are hilarious! Pinching is a form of abuse huh (any reference to one of my previous posts ;))? Happy Birthday Khai Yue. ramai peminat dia. mesti happy if she knows. ;) the 1st thing tht caught my eyes is her long straight black hair. cantik! I also have a Down's child and it is the most difficult challenge of the life of my husband and I. 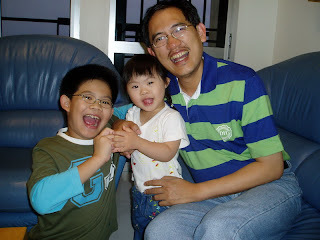 We know how difficult it must be to accept a Down Syndrome child when they are born. We went through a lot of hell also when our Shawn was born. He is doing better now with proper intervention. Thnk you for sharing Khai Yue's story and her family. It reminds us we are not alone. Will put your link to my blog. Hope u don't mind. For Khai yue - Happy Brithday my adorable girl. "Little acts of kindness and support go a long way in bringing sunshine into our lives. " This news is rather old but I would like to chip in anyway. I know Woon Hun's family. The last time I saw Khai Yue, she was just a baby. Me and my wife had no idea about her special condition. It was either Woon Hun did not think it important for us to know or he did not know it either at that time. Khai Yue looked like any other ordinary baby. A cute bundle of joy. Now that we know of her condition, I must say, she is very fortunate. She is born into a family with the right attitude towards life. 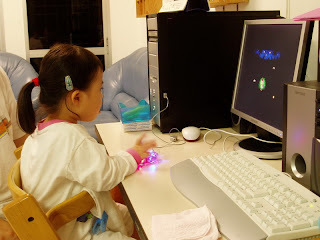 Moreover, her father is a professional who is able to provide her a comfortable life. Others may not be so lucky as in the case of little Chee Keong. Thanks for sharing the pictures. My, how she has grown! She was cute when she was a baby now, she is just adorable. she still looks like an ordinary child to me so may be her condition is a less severe form of the syndrome. I must meet up with Woon Hun's family again, soon I hope.